96 - 00 HONDA CIVIC. 1.6L (1590cc) SOHC L4 16V V-TEC. 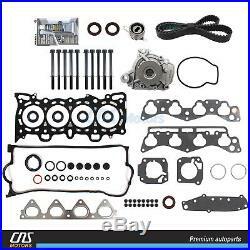 BRAND NEW OE Replacement HEAD GASKET SET HEAD BOLTS W/ TIMING BELT WATER PUMP KIT D16Y5/Y7/Y8. 1 New Timing Belt (104 Round Teeth). 1 New Timing Belt Tensioner (Bearing Assembly). 1 New Water Pump w/ Seal. 1 Crankshaft Front Oil Seal. 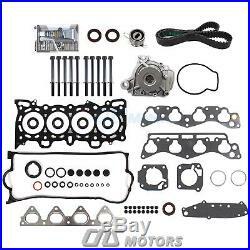 The item "Head Gasket Set Bolts Timing Belt Kit Water Pump for 96-00 Honda Civic 1.6L SOHC" is in sale since Thursday, June 13, 2013. This item is in the category "eBay Motors\Parts & Accessories\Car & Truck Parts\Gaskets\Cyl. Head & Valve Cover Gasket". The seller is "cnsmotors" and is located in South El Monte, California. This item can be shipped worldwide.